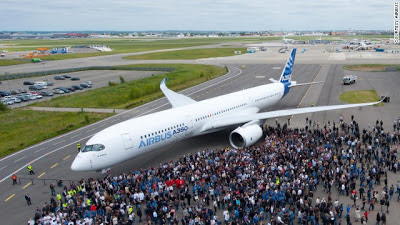 The aircraft is the first in a family of super efficient passenger planes Airbus designed to go head-to-head against rival Boeing's 787 Dreamliner and 777s. "XWB" means "extra wide body." There are three members in the A350 family: the A350-800, the A350-900 and the A350-1000, which seat 270, 314 and 350 passengers respectively, in three-class seating. Critics have said the A350 program -- first launched in 2007 -- was a poorly-designed, hasty response to Boeing's 787. "The company, which was hip-deep in sorting out A380 development, simply hadn't foreseen the huge pent-up demand for a more efficient 250-seat airliner, and tried to take the easy way out by offering a re-engined version of its A330," aviation journalist David Kaminski-Morrow, air transport editor of Flightglobal.com, told CNN in an earlier report. Airbus reworked the design, configurations and technology to increase the plane's range and efficiency. The unveiled plane, which Airbus have tagged "MSN001," will undergo final tests before its maiden flight expected in June.